Anyone excited for this or just for the free Cosmic Boy polybag? I enjoyed the last couple movies with the kids. Cool. Is this where the Cosmic Boy poly is coming from? Usually the movie minifigs are in a plastic case instead on the front of the movie box. I read that the Cosmic Boy poly comes with both DVD and BluRay versions in march. Not sure how they will package it. The films are fine as little, mildly entertaining cartoons, but it really is the minifigs that sell them to me. Was hoping that cosmic boy was going to be available some other way so that we might get Saturn girl with this, but sadly i have also seem stuff to suggest that Cosmic boy comes with this. I buy the DVD just for the figures. Don't need to buy the movie as that is what I have Netflix for. I think the movies are cute and mildly entertaining, but not enough for me to actually want to own hard copies of. I'm definitely guilty of buying them for the figs! I usually give the DVD/Blu-Ray to friends with children, to a charity shop, or sell them on eBay if I'm clearing out a bunch of clothes and collectibles and stuff that week (I'm almost at my goal of having no extraneous stuff!). What? There's a film in those giant boxes? I thought I was just buying a well packaged minifigure all those times. Who's the guy in the slapfight with Brainiac around 1:07? I get the movies for my daughter and I get to keep the minifigure :) She really enjoys the movies. The Lego DC Superhero movies is what prompted me to buy some Classic "Superfriends" Cartoons on DVD. My daughter really enjoys those too. Last time round I got the Blu Ray with the Trickster at HMV. The Disc never made it home. Sold it to our local second hand DVD shop. Is it just me or does anyone else want a cave Batman and Wonder Woman? 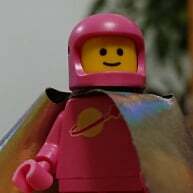 Anyone know where in the UK it is possible to purchase the cosmic clash bluray including the minifig polybag? the he film is great, much better than the last one and heaps of fun, and yes, a cave batman and Wonder Woman would be great fun. Just watch the movie... I enjoyed it; good "popcorn movie". ^^^ I do want a cave Batman and Wonder Woman, as well as a pirate Batman and braniac Superman. Also agree that Saturn Girl needs to be released to complete the Legion of Super Heroes... as a non-exclusive, that is.